January 15, 2017 -- At a meeting of the North Shore Board of Education, Schools Superintendent Dr. Edward Melnick presented his initial budget proposal for the 2017-18 school year. The $102,113,514.86 spending plan represents a 2.63% spending increase over the current year and would be paid for without exceeding the tax cap that New York State imposes on school districts and municipalities. The revenue side of the budget, however, is still a bit murky with precise figures for PILOTs and state aid not yet available. The "inflation factor," used to calculate the district's tax levy limit was not released by the comptroller's office until the week following Dr. Melnick's presentation. The category seeing the most significant jump is health insurance. Those costs are expected to continue to rise, with next year’s proposal allowing for a 6.7% increase over this year’s budgeted amount. Although health insurance costs jumped by 12% in January of this year, the district had budgeted for a 17.6% increase for 2016-17 and so the actual expenditure for this year is likely to be significantly lower than the $11,968,681 that appears in the budget packet. Teachers pay 20% of the premium. Complicating the health insurance expenditure picture every year, Dr. Melnick and Assistant Superintendent for Business Olivia Buatsi explained in response to a question from a community member, is that the number of teachers who choose to opt out of the insurance program is not precisely known at budget time. Additionally the school budget year begins on July 1 while new rates for health insurance kick in on January 1- with the new year’s numbers not announced until December. The increase on the health insurance line will be somewhat if not almost entirely offset by declines in teacher pension costs which, according to figures released by the New York State Retirement System in late November, will decline between 10% and 20% of payroll. The figure in the budget book distributed on Thursday shows a decline of $450,000 in teacher pension costs. This is the third straight year that the state will be reducing the percentage of payroll that districts must pay into the retirement system - down to 9.5%-10.5% of payroll from a high of 17.4% during the 2014-15 school year. Instructional salaries also represent a significant unknown, with teachers having been without a contract for the past seven months and no agreement appearing on the horizon. Asked by a community member how the figures for those lines are arrived at without a new contract in place, Dr. Melnick replied that under the “Triborough Amendment,” which keeps in place provisions of the expired contract, teachers still must receive their “step” increases (salary increases that are earned each year by teachers early in their careers as they gain more experience and presumably become more effective) which he said will amount to about a 2.4% salary increase. 30% of teachers in the district however, are off-step with their salaries frozen at where they were in the expired contract. In the budget packet, regular teacher salary lines show an overall increase of about 3.9%. At the high school there is actually a decline of $58,726. Glen Head School shows the greatest increase of all the buildings - $423,788. Included in the aggregate salary numbers are three and a half new teaching positions - three district-wide ENL (English as a New Language) teachers, and a part-time Music Theory teacher. Dr. Melnick said that the addition of the ENL teachers is required under state law. The resulting increase those positions add to the salary and benefits lines, however, will more or less be offset by a decline of $351,100 in debt service payments. One new administrative position is being created - Director of World Languages, at a cost of $164,507. On the revenue side, with the Consumer Price Index on the rise, the “inflation factor” that is used to determine each school district’s individual tax levy limit, was announced on January 17, and at 1.26% is significantly higher than the 0.12% used for this year’s budget. Additionally, Dr. Melnick explained on January 12 that the district was still awaiting information on Payments in Lieu of Taxes that are paid on LIPA properties, as well as State Aid which is typically not known until after the state budget is adopted on April 1. Another $500,000 will likely be needed from reserves in order to balance the proposed spending plan. If the board wanted to bring the spending side of the budget down from a 2.63% increase to a 2% increase, the Superintendent said, it would have to shave about $630,000 from the proposal. On the revenue side, that would most likely affect the amount used from reserves, not the tax levy since that would already be within the limit. The Board will begin its line by line review of the budget at its next public meeting on January 26. ​During his initial budget presentation on January 12, Schools Superintendent Dr. Edward Melnick stated that reducing the distance requirement for 7th and 8th graders to receive bus transportation to the middle school, so as to make it equal to that which is required for sixth graders, would have no impact on the district’s transportation costs. The new distance requirement could only go into effect after approval through a community referendum. Currently, in order to receive bus transportation, 6th graders must live a distance of 1 mile or greater from the middle school, while the minimum distance for seventh and eighth graders is1.5 miles. 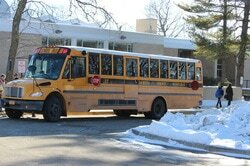 Based on the findings of a recent study, the superintendent explained, the district would not need to add any buses to those already serving 6th graders to accommodate 7th and 8th graders. Other options, such as reducing the distance to ¾ of mile for those in grades 6-8, the same distance requirement that currently exists for elementary school students, would cost the district in the neighborhood of $200,000, the superintendent said, and if that were to be the minimum distance requirement for all students in grades k-12 - it would be nearly $1 million. Any change would require community approval, whether there is an increase in cost to taxpayers or not. Dr. Melnick advised that the board discuss the issue at a later meeting and consider putting the question before residents when the budget vote and trustees election is held in May. If the board chooses not to put it up for a community vote, under state law, residents can petition to have the proposal included on the ballot. Updated with correction on January 26, 2017 -- The North Shore Board of Education just recently completed interviews with 15 candidates being considered to replace Schools Superintendent Dr. Edward Melnick when he retires at the end of this school year, said Board Vice President Sara Jones at the January 12 North Shore Board of Education meeting. Using that profile, Trustee Jones explained, the board selected the 15 candidates from the approximately 50 applicants who had submitted resumes. The next step, she said, is for the board to winnow the pool to about six or seven who will return for a second round of interviews. Trustee Jones said that the board is confident the process will be completed this spring. CORRECTION - An earlier version of this article incorrectly stated that the hiring process would include forums at which community members would have the opportunity to meet and ask questions of the two or three finalists. While that was discussed as a possibility by the search firm at at least one public meeting, it was never agreed to by the school board. There will be no such opportunity.